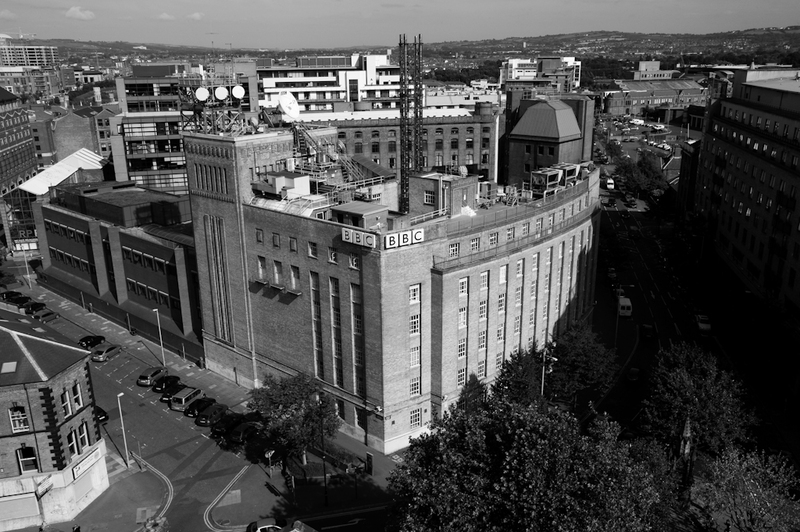 The BBC commissioned a Scottish architect, James Miller, who was already working on an extension of the BBC studios in Glasgow. He was an interesting choice. At the time of his appointment in 1936 he was in his mid-seventies. Miller had built a formidable practice with its roots in his early employment with the Caledonian Railway Company. In the course of his long career he designed 68 railway stations, eight churches, notable Scottish hotels such as the Turnberry and the Peebles Hydro, Glasgow Royal Infirmary and the palatial interiors of RMS Lusitania. His first attempt to put his mark on the Belfast skyline came near the turn of the century when he was placed third for the competition for Belfast City Hall, with an enormous baroque design. But he was more successful soon afterwards when he won the competition for the 1901 Glasgow International Exhibition, just five years after setting up in practice. Among the other entries was one by Charles Rennie Mackintosh. Later he won the competition for the prestigious headquarters of the Institution of Civil Engineers at Great George Street, Westminster, a stone’s throw from Downing Street. The emphasis on simplicity reflected the announcement 10 years earlier of the plans for Broadcasting House in London, designed by Val Myer. Like the Portland Place HQ, Belfast BH was to be on a corner site, with a curved frontage and a façade receding at fifth floor level, with a balcony. Its treatment was Art Deco, reflected notably in the front entrance, modified following a 1970s bombing, and the detailing on the tower in Linenhall Street West. 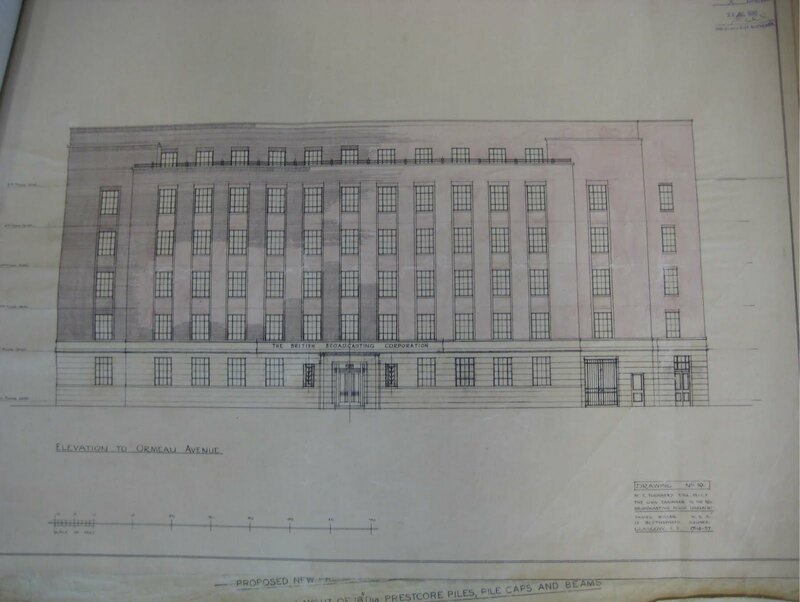 The plans lodged in 1938 also bear a resemblance to part of St Andrew’s House on Calton Hill in Edinburgh, built to be the home of the Scottish Office. Its architect was Thomas Tait, a leading designer of Art Deco buildings, who was obviously known to Miller and his staff. In fact Miller’s practice took over from Tait the contract for a model village in Essex, commissioned by Francis Henry Crittall, to provide houses for workers in his factory making metal window frames. Crittall windows were later used in BH Belfast and are now regarded as one of its architectural features. By the outbreak of war the steelwork was up and, although many fewer workmen were available, it was agreed to carry on with construction. Though unfinished inside, it was ready for occupation in May 1941. The first staff moved in just a few hours after Belfast suffered its heaviest air raid of the war. The blitz by 200 German bombers – known as the fire raid – lasted more than three hours and saw 100,000 incendiaries and 230 tons of high explosives dropped on the lightly defended city. Upwards of 150 people died and 700 were injured. The shipyard and aircraft factory were extensively damaged and large parts of the city centre lay in ruins. The banqueting room of the City Hall was destroyed. But Broadcasting House was unscathed. Understandably there was no official opening ceremony, but later that week the Prime Minister of Northern Ireland, JM Andrews, the Governor, the Duke of Abercorn, and the BBC’s Director General, Frederick Ogilvie, and their wives ‘inspected’ the new building. Post-war building restrictions and a shortage of BBC funds meant it was more than ten years before most of the building was fitted out, but as late as 1961 it was discovered that one studio still had bare brick walls hung with carpet felt, the temporary wartime acoustic treatment from 1941. 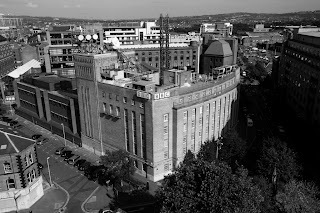 Broadcasting House was given listed status by the Department of the Environment in 1994.